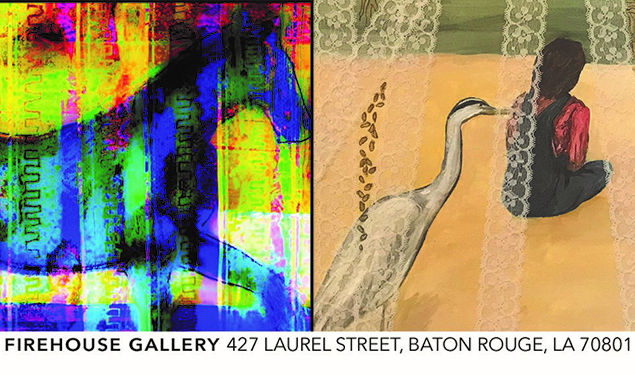 Five artists and long-time friends will exhibit and perform music, poetry and fiction in a mixed-media event and exhibition. The graphic art will include photographs, paintings, and mixed media pieces. The music will be original jazz, folk and rock performed by the composers. The readings will be poems and fiction read by the authors. Charles deGravelles has published fiction and poetry in literary journals and anthologies. His books include The Well Governed Son (New Orleans Poetry Journal Press) and Billy Cannon: A Long, Long Run (LSU Press) which won the Louisiana Library Association Best Book of 2015. He is also a composer, photographer, and painter. Michael Palmintier is best known musically as the lead singer in the Bench Bar Boogie Band, a popular Baton Rouge band. He has performed his original music in a wide variety of venues. John S. Tarlton is a novelist and short-story writer whose published work includes the novels Window Facing West (Bridgeworks) and The Cost of Doing Business (Bridgeworks). He has also published literary journals and anthologies of southern fiction. Nancy Von Brock is an art teacher (University High School) and painter whose works have been exhibited in galleries and juried exhibits.